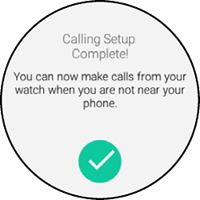 ensure the Advanced Calling feature is activated on your smartphone. Android, iPhone 7, iPhone 6, iPhone 6s, iPhone SE. ensure the Verizon Messages app is installed (Android, Apple iOS) and updated (Android, Apple iOS) on your smartphone. 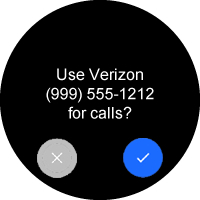 ensure the Verizon Messages app is the default messaging app on your smartphone. 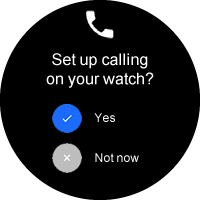 From the Set up calling on your watch screen, tap Yes to begin. If necessary, press the Power button (on the right edge) then tap Calling Setup to resume. 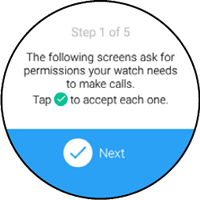 Tap Next to begin permissions setup. If presented, tap the Check mark icon to allow Message+ to make and manage phone calls. 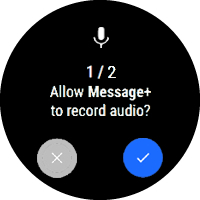 Tap the Check mark icon to allow Message+ to record audio. Tap the Check mark icon to allow Message+ to access the watch's location. 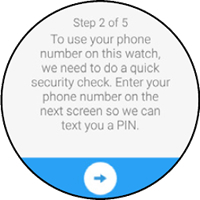 Allow several minutes for the watch to fetch details from the smartphone. To continue, tap the right arrow icon (located at the bottom). Enter your smartphone's 10-digit number then tap the Check mark icon. 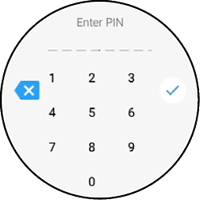 A verification PIN is sent to your smartphone. Enter the appropriate PIN then tap the Check mark icon. 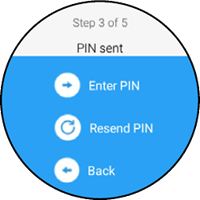 To locate the PIN, open the messaging app on your smartphone. 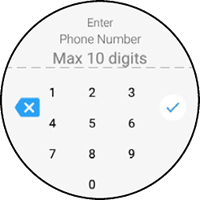 Tap the Check mark icon to use the on-screen mobile number for calls. This info is transmitted to the emergency dispatcher for all 911 calls made on a Wi-Fi network. 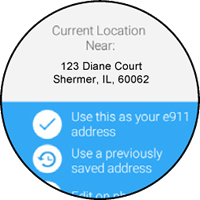 If editing on the watch, enter the appropriate address info (e.g., street address, city, state, zip code, etc.) then tap Ok. If address validation fails, re-enter or use a different address. If prompted, tap the Check mark icon to confirm and complete setup.